and during the period of snowfall and cold, this range is an entirely different beast. While the notion of climbing to the apex of one of the many cloud-carving goliaths seems intimidating and prohibitive to most in the valley during the summer, doing so while the Wasatch is encased in snow is downright unimaginable. For some impetuous local mountaineers, however, the endeavor is exhilarating, sublime, and worth the struggle and risk. 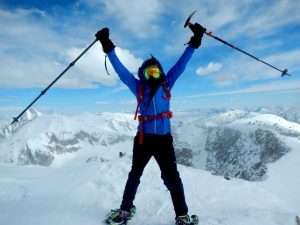 If you’re an individual with a bit of cardio, grit, and interest in learning, surmounting one of the glistening peaks in the winter is merely a matter of will and determination. Sports like this, of course, are contingent upon connecting with a community; knowledge is often best passed-down by a mentor, as it is not wise to approach these expeditions alone (particularly on one’s first attempt). While social media may be among the modern practices keeping people either indoors or buried in their smartphones, it has served as an incredible mechanism for bringing together like-minded folk from all walks of life. This sport is no exception. While many local groups have existed long before the induction of social media in contemporary consciousness, platforms like Facebook have played an essential role in uniting and organizing mountain junkies and their activities. The most prominent and active among them include the longstanding Wasatch Mountain Club and the accurately named Wasatch Mountain Wranglers, collectively comprised of 7,375 members (the latter having the most at 5,502). Each group routinely organizes a variety of expeditions into these mountains throughout the year, serving as an inclusive environment in which locals at any level of practice can get connected with exhilarating trips, as well as experienced, knowledgeable, and passionate mentors. Over the course of the past few weeks, I reached out to some of the impetuous Utahns to determine just why they do it, what it takes, and what advice they may have for newcomers. At every level of expertise, these determined individuals all have something that drives them to these peaks. Courtesy of Nicole Frazier Condie. 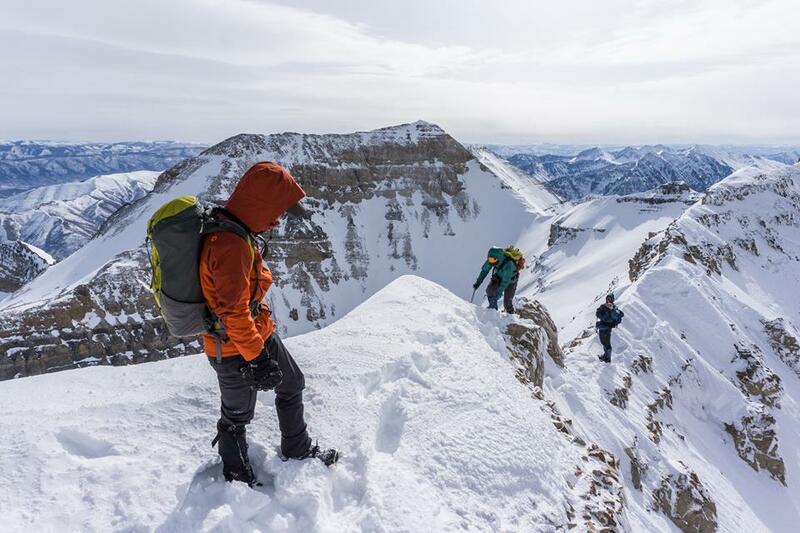 This quiet extreme is something Condie came to learn most profoundly on her perilous group expedition up South Thunder Mountain (11,154 feet) last March. 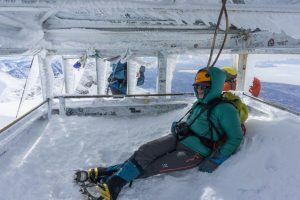 While the weather had fared well for her group throughout the day, Condie says “the wind changed dramatically up after 10,500 feet to 50-60 mph gusts. One smaller woman on the team was actually lifted and fell from the wind during the last push to the summit. As sharp ice flurries burned past my face I worried that the wind would pick up one of those large pieces, sending me over the edge. 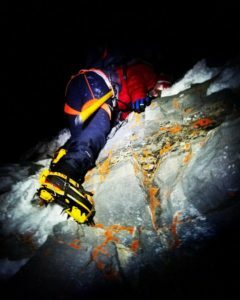 But I pressed on, unable to see or hear the others in my party.” Despite the treacherous conditions, including — at one point — making a wrong turn toward a precarious ravine and later having to learn how to glissade with an ice axe on-the-spot. Condie persevered nonetheless, leaving her with the sense of accomplishment. “I really had done something. I really lived in that moment. Something beautiful truly awoke in me,” she says. “I enjoy being reminded how small I am in the grand scheme of things. I also enjoy the difficulty, and training my mind with the fortitude to overcome some of the most difficult obstacles I have ever encountered. My experiences in the mountains have provided me with the wherewithal to endure many other trials in my personal life,” he says. 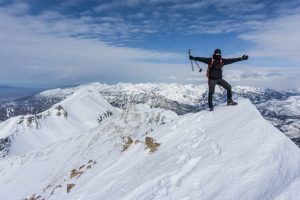 Jonathan Scott, a Utah County native and active all-season mountaineer in the Wasatch Mountain Club, finds himself drawn to these peaks in winter due to the sublime challenge they hold. “[In the winter] there are more variables that make it more difficult, but also more rewarding, like solving a 1,000-piece puzzle as opposed to a 100-piece puzzle. I like challenges, and the winter offers that for me,” Scott says. Scott urges newcomers not to shy away from the challenge, however daunting it may seem. Tanner Maxwell is an avid Wasatch Mountain Wrangler and photographer. He finds a sublime aesthetic and self-actualizing potential on these ridges. 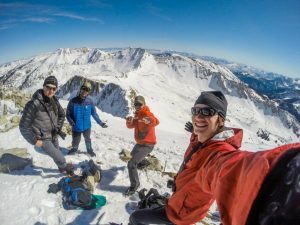 Each of these practicing winter mountaineers had their own perspectives on the greatest risks associated with the mystifying sport and tips to ensure a safe and positive experience, but one thing that remained consistent in their responses was that avalanches are among the greatest possible dangers. One must always be mindful of conditions on the mountain — to “know before you go,” if you will. 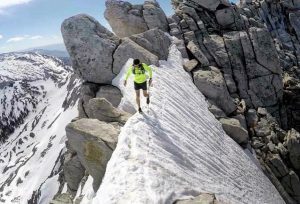 Other potential dangers associated with this sport are dehydration, exposure to the elements, snow and ice hazards, like melting cornices and snow bridges, and, of course, involuntary sliding and falling. 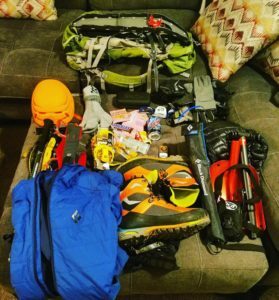 While you don’t necessarily need to break the bank when attaining equipment, particularly while you are still uncertain whether or not the sport is for you, you should always err on the side of quality equipment, since cheap and unreliable gear can either ruin your day or even cost you your life. It is a general rule of thumb that any gear you will trust your life with — this includes ropes, harnesses, carabiners, etc.— should not be bought for just this reason. 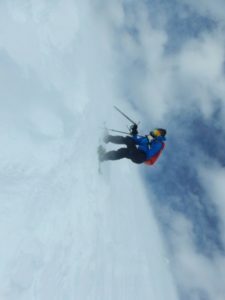 Though virtually any snow-covered peak or route can be taken on with sufficient gusto and preparation, some of the most popular and appraised are the Pfeifferhorn, the Everest Ridge, and Timpanooke routes on Mount Timpanogos, South Thunder Mountain, White and Red Baldy, Lone Peak, Mount Olympus, and the Tripe-Traverse goliaths: Dromedary Peak, Sunrise Peak, and the Broadsfork Twins. Title photo courtesy of Tanner Maxwell.